Mountbellew/Moylough and Corofin will meet in the replay of the 2018 county senior football final in Pearse Stadium on Sunday (1.45pm ). Anyone attending the replay will be hoping for a far more open and attractive game of football than the one the sides produced last Sunday. 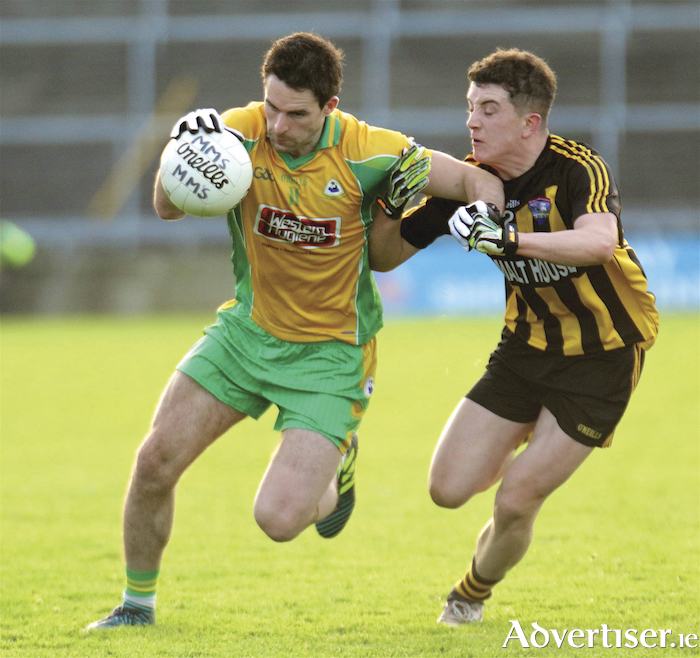 It ended 0-7 to 0-7, with Corofin captain Michéal Lundy punching his side’s equaliser deep in injury time. That champions Corofin only scored 0-1 in the first 28 minutes of play, with the half-time scoreline three points apiece, tells much about the first half. And it is unlikely Sunday will produce an open and free flowing game as Mountbellew will no doubt stick to the template that almost brought them a first senior title since 1986m when men such as Val Daly, Colm Finnerty, Brian Barrett, Anthony Colleavy, Padriac Tully and Jimmy and Tommy Gavin were in their pomp. Their plan of putting all players behind the ball and disrupting Corofin’s attack almost worked a treat, and they were the more efficient and effective team for the bulk of the game. When they turned Corofin over, they used the ball well, and they notched three points from four attacks and only shot one wide. In comparison Corofin were wasteful up front with nine wides, and Michael Farragher, Gary Sice and Jason Leonard were all wayward with efforts that should have raised flags. Mountbellew’s manager Michael Donnellan and his selectors have been working on their system diligently, and it is a plan that is very difficult to counteract. They were beaten by 10 points in last year’s final in an open game of football and they will do whatever it takes to be competitive and be in with a shout of winning this year. Who can blame them for that? They had big displays last weekend from the impressive Eoin Finnerty, John Daly who carried out a lot of ball from defence, Colm Mannion who linked play well, and Barry McHugh who did well on the Corofin rearguard. Corofin looked a tired and jaded team at times last weekend.They had not been going well during the summer, and their fluidity, smooth link play and hard running from last March’s sublime performance when they took Nemo Rangers apart in Croke Park looks like what it is – a long time ago. It was seven months in fact, and unless their main players can find their mo-jo for this weekend’s challenge, then Mountbellew will feel they have a real chance of a historic win. Michael Donnellan is hoping his team can produce a performance on Sunday they that will be proud of. “We were very proud of the lads last Sunday. They gave it everything they could and they have worked really hard all season," he says. "They are a super bunch of young men. Corofin’s manager Kevin O’Brien is weary of Mountbellew, and knows his squad will have to be in tip-top shape if they are going to get that elusive six-in-a-row. “It shows the character in our squad that even though they were not going as well as they would have liked last weekend, they stuck it out to the death and produced an equaliser when it looked like they would be beaten," he says.